The good news is that we’re halfway through Logan’s field training! It’s been harder than I thought – naively, I just didn’t think too much about how it would be for him to be gone. He hasn’t had his phone while he’s there, but I got a letter last week and it was SO good to hear from him. But the good news is that friends and work have kept me really busy, and somehow we’re already halfway through. In honor of him being halfway through, I wanted to share our last date before he shipped off for this week’s TriangleTuesday. For one of his last good meals before leaving, Logan chose Lilly’s Pizza. 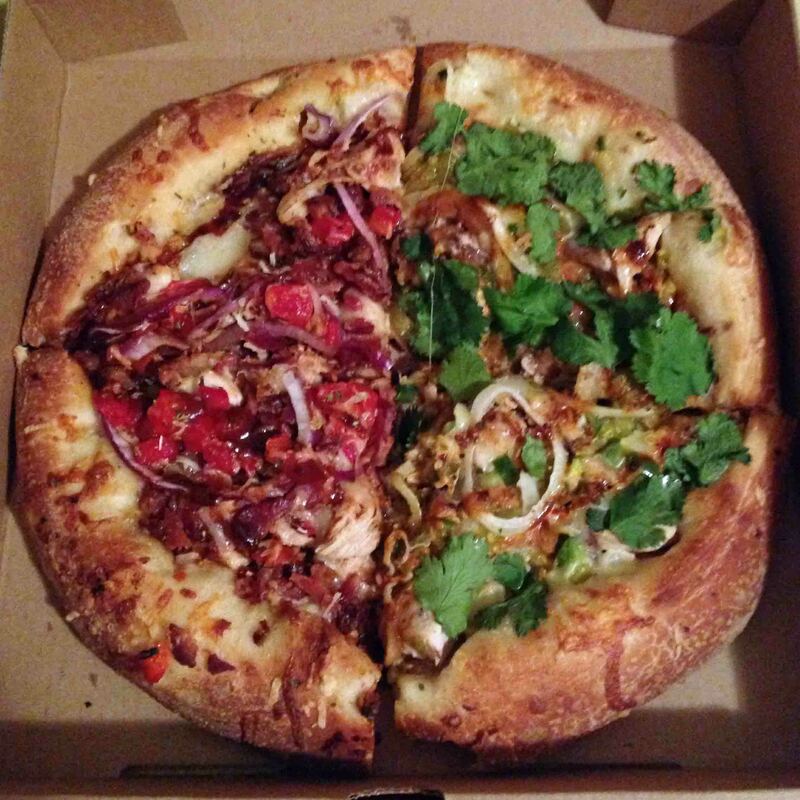 Located downtown near Brightleaf Square, it has become our favorite place for good pizza. We’ve gotten to the point that if we want pizza for dinner, it’s either frozen at home or its Lilly’s. He didn’t know I was taking this photo, honest. He just looks that cool naturally. Lilly’s is a great place to come with friends – there’s a laid back vibe perfect for laughing with friends. The whole place is full of funky art on the walls, and there’s a tricycle at the hostess stand. There’s a good amount of outdoor seating, which is great for a warm summer evening like the evening we went. Menu-wise, they have a pretty extensive Italian-style menu. There’s a bunch of non-pizza options, but I’ve never even glanced at it. If you’re going to Lilly’s, just stick to the pizza. Totally worth it. So I chose the Big Star – pesto base with roasted red peppers, three kinds of cheese, and pistachios. I was hesitant about the pistachios – cooked? On a pizza? I love them, but I’d never had them in something or cooked. They were… unusual. I liked them, but they were also strange. Their texture changed from the heat, but they still had some crunch and still had the quintessential pistachio taste. So I enjoyed their creativity and will keep eating them on there, but I won’t be reaching for nuts to put on my next homemade pizza. And the rest of it was AMAZING. I love pesto – my mom makes the best homemade pesto, I didn’t even realize you could buy it premade until I was living on my own, but that’s another story. The pesto base was perfect with all the cheese, and roasted red peppers are my jam, so this pizza was a win for sure. Reacting to my choice of a pizza with no meat on it, he chose the Super Duper. It has tomato sauce, cheese, and about 4 different forms of meat. So whatever healthy attempt I thought I was making (you’re smiling and nodding, right? ), eating his pepperoni, bacon and sausage slice meant that I quickly hushed those instincts. From a previous Lilly’s adventure: Dante’s Inferno on left and South of the Border on right. Getting two smalls is still enough for us to eat half (meaning a quarter of each, we usually share) and take half home. I love making good food last two meals – that means you got it for half price. And that, friends, is always a win. My take: Lilly’s is the best pizza around. Eat in or carry out, this is great stuff and should not be overlooked for dinner in the Triangle! The good news: there’s also a location in Raleigh (which I haven’t been to) so multiple locations of amazingness!